Roy, I look forward to following your cruise as you post to this thread. With both you and Kathi posting to threads it will be almost like we are going along with you. Hope you have a great trip and an enjoyable cruise. Thanks Krazy Kruizers, Kathi, and travelnap. I am starting to get settled in but running far behind on writing due to our late sailaway. 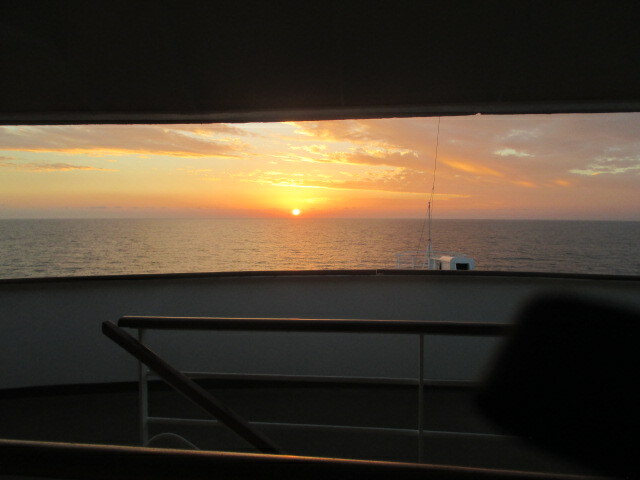 We did get our late arrivals on board and are underway with smooth seas. Glad the captain was nice enough to wait for late arrival passengers. Sounds like it has really improved since the time we were there. 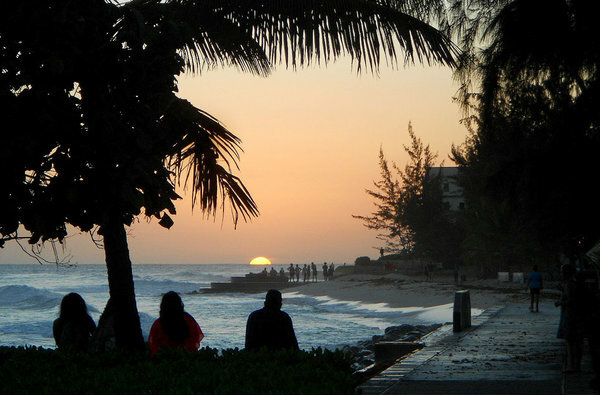 Good news indeed 🙂 It was the Bimini Boatyard back when we went. It's a lovely spot so if food and service are good, I'm not surprised. Thanks Jacqui and Krazy Kruizers. I'm finally back. Despite my early start Thursday and not setting an alarm I was up at 5. I did not leave the room until about 7:30. My walk was essentially a breakfast walk, stopping at Burger King for skim milk and Panera for a fruit cup which supplemented a couple of things I had from home. 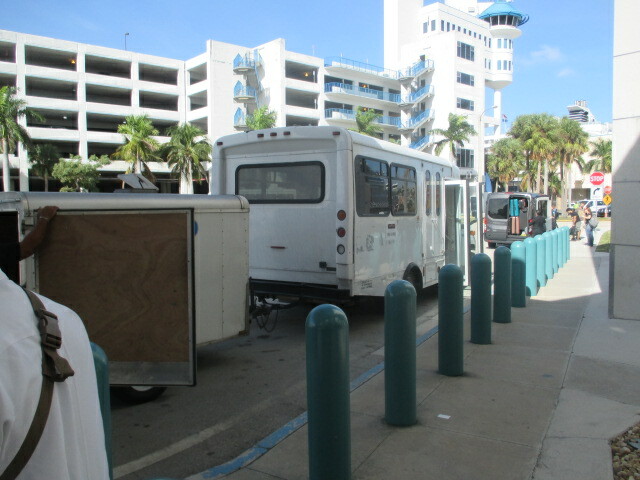 The Renaissance has a shuttle service to the cruise port and their desk opened at 9:30. I took my 2 bags to be given to the porters down then. It appeared that only one of the 2 elevators was working and it was a total zoo. I eventually took the up elevator to claim a space, up from 3 to 10 and back down to the lobby. I left the bags with the bell staff and made a reservation on the 10:45 shuttle. shuttle. The shuttle showed up pretty much on time. 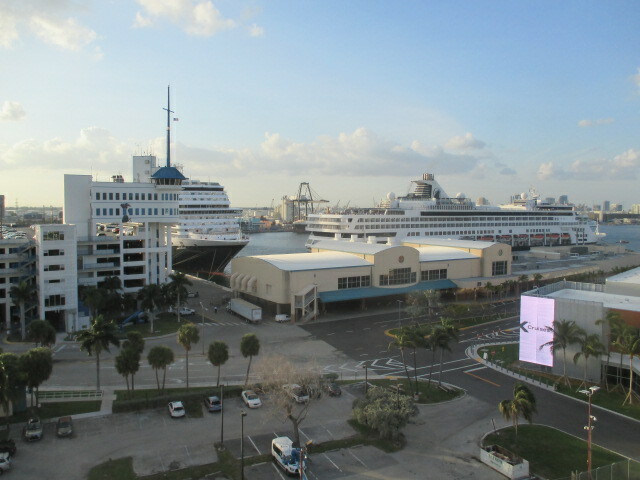 There were 5 ships in port with Celebrity Reflection, Silver Spirit, and the 3 Holland America ships, Koningsdam, Veendam, and Prinsendam. We had people on the shuttle from all of them except the Silver Spirit, but we were the first ones dropped off just after 11. Checkin went quite quickly. This time nearly everybody was in the line for either suites or 4-star mariner or above. We took the escalator up to the upper level of the lounge and boarding started about 11:30 and moved quite quickly. I think my being a largely Crystal person got the better of me as I boarded. Cruise Director Linda Minnikin, Hotel Director Rene, and 2 other people were at the gangway greeting people but I was a bit oblivious to the presence of the other 2. 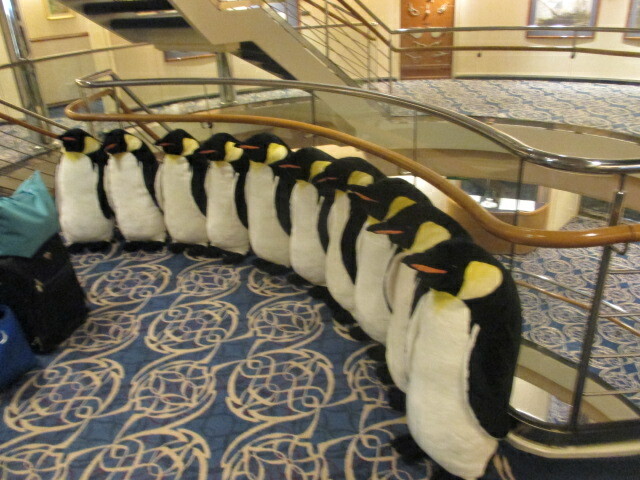 As we came in the gangway we were greeted by a row of penguins lining the atrium railing. instead of a picture window. My first 2 bags were delivered about 15 minutes after I returned from lunch with the 3rd about 20 minutes after that but the final one not until almost time for the muster drill. The first stage of the muster drill came at 4PM with stages 2 and 3 at roughly 10 minute intervals. I could see the Celebrity Reflection out past the breakwater from my muster station but it was a while before any other ships left. 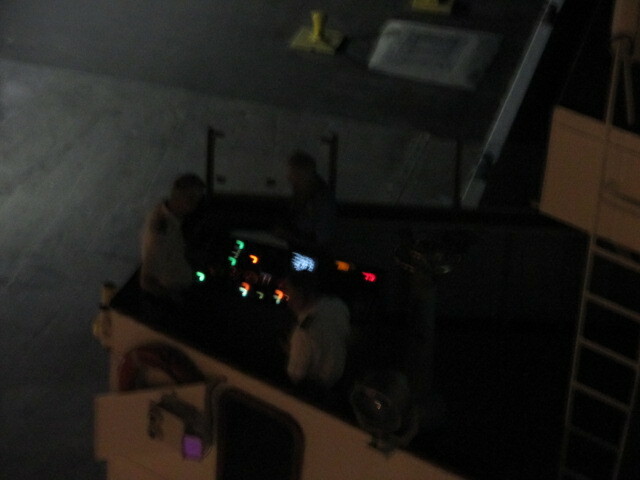 After the drill I headed up to deck 12 forward for sailaway. I was there a long time. 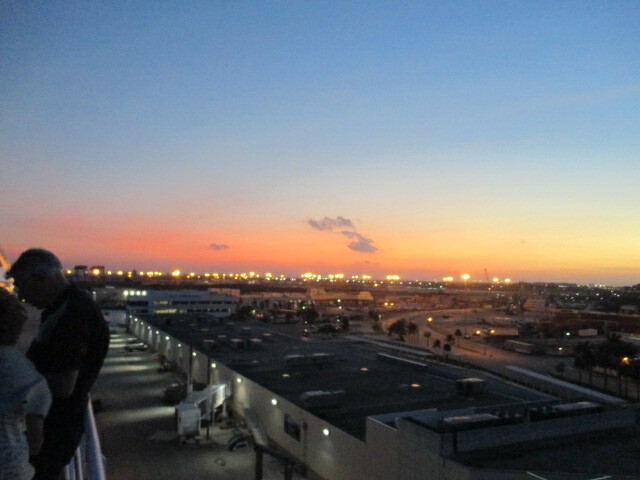 At first I had a very nice view of our 2 sister ships docked actually quite close to us. I watched the Veendam leave first followed almost immediately by the Koningsdam. Once they left I went down to the lido café for some food, pork, string beans, and mash potatoes. Our Cruise Critic group formed a table in the dining room and I had told them I would get my entree there and join them for coffee and desert after our departure. Captain Jeroen had alerted us that we were waiting for some passengers with delayed flights (I assume booked through HAL or else we would not have waited) but the wait just went on and on. We had a lovely sunset a little before 6. Soon after I returned to my vantage spot Kathi (Scrapnana) joined me. The missing passengers entered the terminal side door about 6:15, and a few minutes later Captain Jeroen reported that we were ready to leave but first needed official clearance. He said we would likely leave a little after the Silver Spirit which was due for 7PM. The Spirit actually left about 6:50 but moved a lot more slowly than I would expect from a small, nimble ship. We started to move at 7:05. There’s a tradition at Ft. Lauderdale that ships toot their horns as they sail the channel in front of a complex of condos. While it was quite dark as we left the harbor Captain Jeroen put on a nice display of the horns on the Elegant Explorer. There was one welcome aboard show at 7:30. I knew my tablemates in the dining room were long gone and I stopped in the lido for my much anticipated slice of key lime pie and was then sown at the showroom about 7:35. 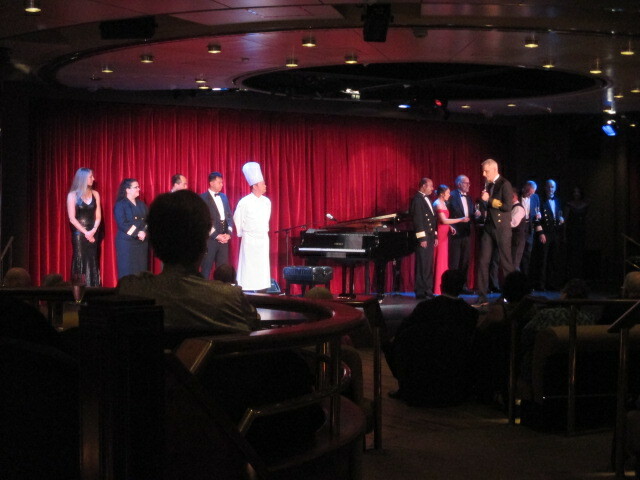 Cruise Director Linda Minnikin was introducing the show band and then went on to introduce the rest of the entertainment staff. I spent most of the rest of the evening in my room but did briefly go up to the Crows Nest for a Diet Coke and a little bit of entertainment. Stevie is no Debby Bacon but he started the evening off still on quite a high noted, both talented and personable. My parting shot is that my 80 days on the Prinsendam is my longest consecutive ever on a single cruise ship (up from 72 days on the Crystal Symphony) and I doubt if I will ever have another such single long stint. I think it’s off to a pretty good start. Nice to see that you have Hotel Director Rene. We had him on our last cruise and he's quite social and often out and about. Great report and love your pictures. Don't be surprised if you find one of those penguins (or one similar) as a pillow gift some night. 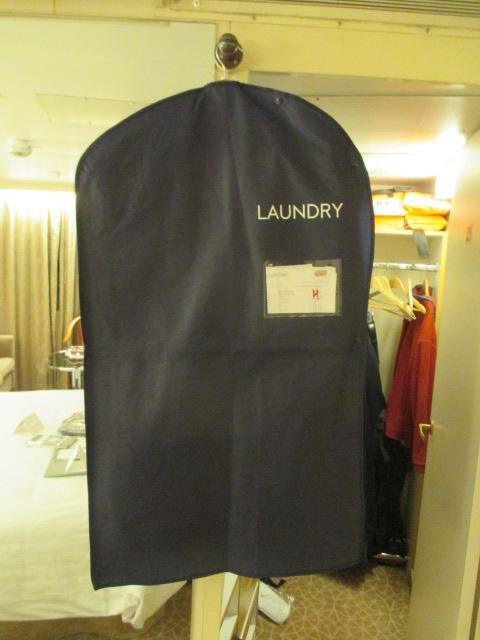 I got one on my first Antarctica cruise, and that wasn't even a Grand Cruise! Thanks Jacqui, Krazy Kruizers, TiogaCruiser, SirPMP, and RuthC. Still not in full writing mode but haven't been completely idle. 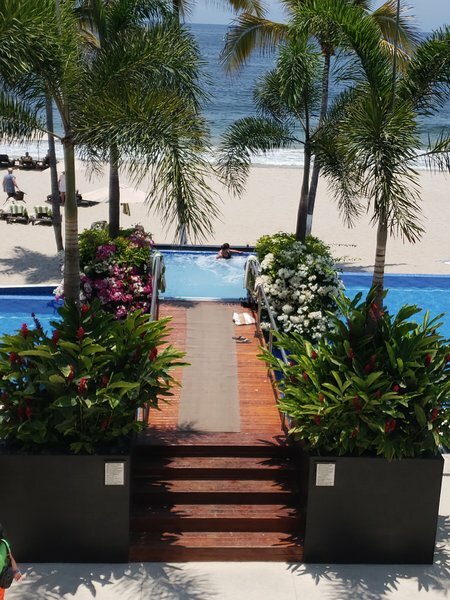 I've updated the blog http://morethangetaways.wordpress.com with the first 3 When and Where, the first 3 MDR menus, menus for Canaletto, Sel De Mer, and DiveIn, and the Grand Voyage Laundry package options and updated special events list. They are accessed by the drop down menus for programs, menus, and extras or the site map on the left side of the blog home page. Tablets may need to be in landscape mode to reach the site map. Most of the menus came from the Navigator. It was odd that the menu for Pinnacle Grill actually brought up the Dive Inn menu. I will check out the link later. Is the Hotel Director Rene' Tuinman ? I did not set an alarm but was up close to 5AM. I have a sore spot on my left instep and am babying the foot so I did not do much walking. I just went up to the Lido for coffee and we were sailing eastbound along the coast of Cuba. Sunrise was about 7 and I was just a bit late for it, catching the sun just above the horizon from the deck 8 porch. 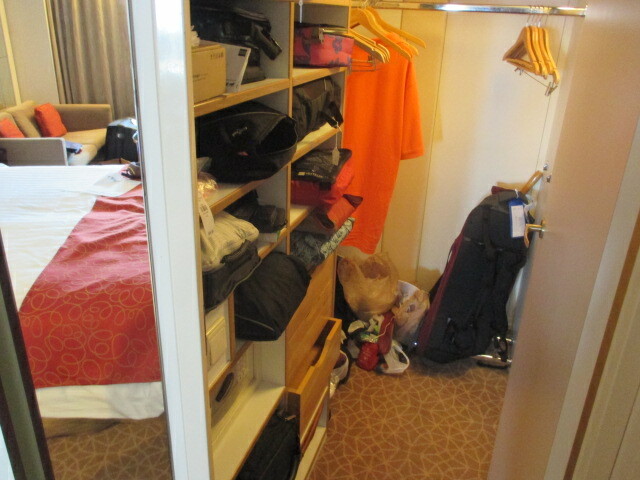 I walked a total of 6 times around the ship for a total of 1 ½ miles with 2 of the “laps” being diverted up to deck 9 on the forward outdoor steps and then up the inside steps to the lido, down the aft outside steps and around to the forward entrance. 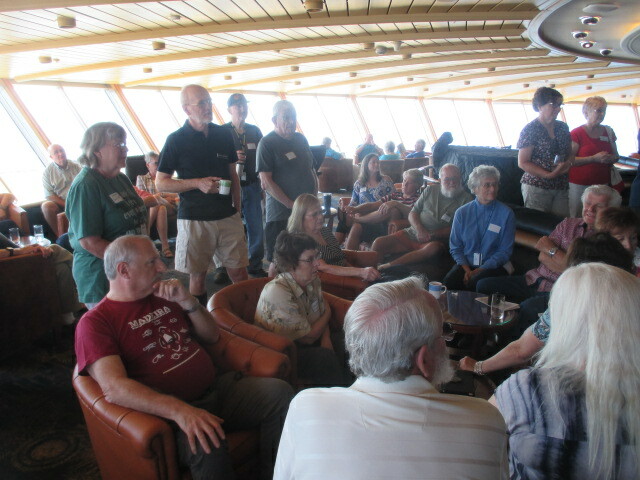 My biggest event of the day was the Cruise Critic meet and greet at 10 in the Crows Nest with about 60 Cruise Critic members as well as Cruise Director Linda Minnikin and Hotel Director Rene Tuinman stopping by. While we were there I made our final selection of cabins for Sunday’s Cabin Crawl. I have everything out of my suitcases but am not really unpacked. My shelves are pretty full of boxes and packing cubes so I’m a bit organized but still have a lot of individual things to stow. Lunch was largely pizza from the lido. In the afternoon a guest “ambassador” from Colombia gave a presentation of Santa Marta in the Showroom. Most of us found her talk a bit disjointed. I sent my sports coat out for dry cleaning in the morning. It came back around dinner time in one of the new blue laundry return bags. They are quite nice and can be used many times over. My first Gala night was also my first night with my new tablemates. We had agreed to form a table on our Cruise Critic Roll Call and I had met several of them at the Boatyard but a couple of them I had not previously seen. The 5 of us are at Table 19, a 6-top right at the end of the forward dining room annex right next to the Ocean Bar. Our waiters are Adnyana and Tinus. 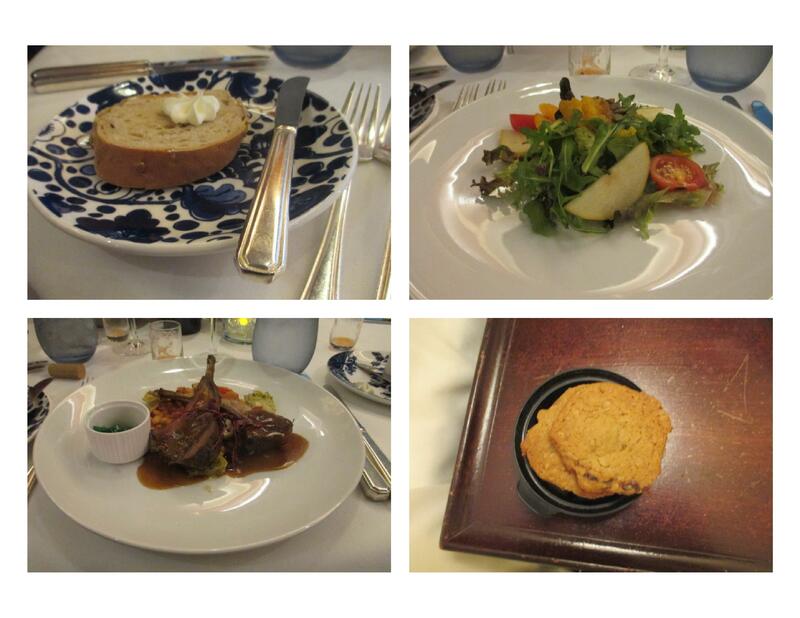 For the first dinner in the dining room I chose the salad, Rack of Lamb, and Strawberry Romanoff. I had forgotten to take a picture of the desert but did get a couple of cookies in the Lido. Crystal serves Oatmeal Raisin cookies that are to die for–these are not quite as good but still VERY nice. The sun was just setting as I arrived at the dining room. We had the Captain’s introduction between dinner seatings. Captain Schuchmann greeted guests at the door and sparkling wine was served (but not a formal toast), and he introduced the senior staff on the Elegant Explorer. 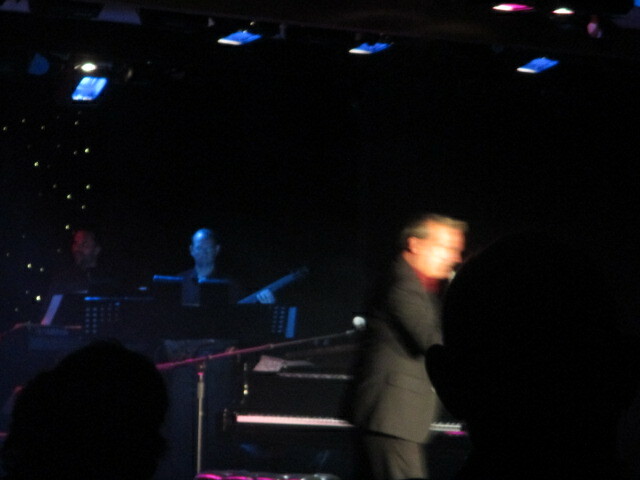 The featured entertainment was pianist Paul Pappas. He is a very high energy performer and kind of specializes in long medleys of songs. He played a little of everything from jazz to rag time to rock to pop and even Clair de Lune by Debussy. I did some work after the show but did not really accomplish a lot. I did stop by the Ocean Bar for a Diet Coke but that was the only time I was out of the room. My parting shot will be about my room. I had originally booked one of the solo cabins and loved it on the transatlantic but had decided for 80 days I wanted a bath tub. I spent about 45 minutes in the tub soaking my sore foot. I’m not sure if it helped with healing or not but it really felt good. I am delighted that my old room has found a nice new occupant and now very comfortable with the investment made in the room swap. You are correct on that. I'm guessing you have sailed with hem. Glad you have table mates compared to your last cruise. Sorry to hear that your presenter for a talk on Santa Marta seemed disjointed. Hope the others will be better. Those blue bags that laundry comes back in look really nice. That is nice that they can be reused. Enjoy following your blogs. Good to hear about the reusable laundry bags. The 5 of us are at Table 19, a 6-top right at the end of the forward dining room annex right next to the Ocean Bar. My favorite table on that ship! I always select it, and have been assigned there the last two cruises. Another favorite of mine. I haven't seen him in several years now, and am happy to learn he is still out there performing on HAL. I must have missed it, but could you please report what kind of cabin you have? Is it in the older section, or one of the newer cabins? I used the magnet to hold my cane. out of the way, yet handy. And just hanging there is was hard to forget when heading out. 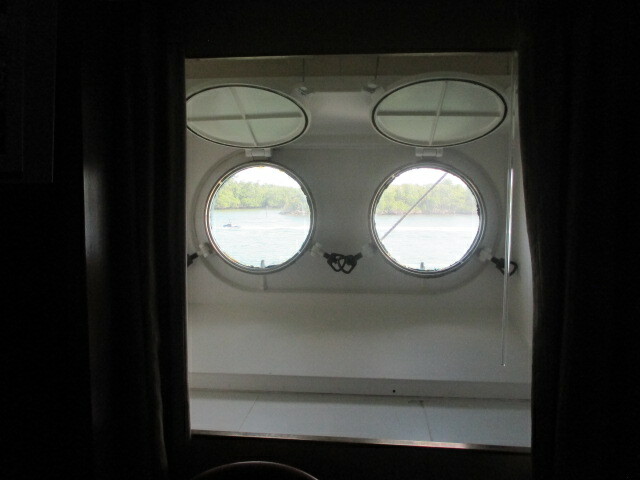 I am in 421, a dolphin deck original cabin with portholes. I am extremely impressed by your ability to stay current in your posts. I'd be posting from 1997 at this point. I showed DW your itinerary map and she commented that there was hardly anywhere you *didn't* stop this cruise. Fair winds Roy. I so enjoy following your blog (and now Kathi’s). It is a real treat to read during these gray Ohio winter days! Ah, thanks. I remember the pictures and description now. Old lady; old brain. Sometimes I need a jump-start.